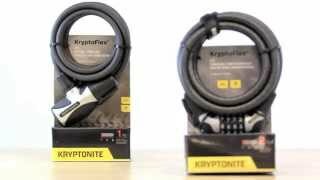 The Kryptonite KryptoFlex 1518 Key Cable Lock is an extremely flexible straight cable lock. Twisted steel cable for lightweight yet sturdy security with a 15mm diameter and 180 cm length. Reinforced lock head construction with Talon lock pin retention system provides extra holding power. Pick and drill resistant disc style cylinder keyway with dual sliding weather guards that automatically close. Lock head rotates 360 degrees for easier handling during lock-up and removal.